This is alway a huge hit and it’s really not hard at all to make! I made it for my grandparents recently and when my grandmother opened the box her eyes started to twinkle and a big smile appeared. She quickly closed the box and put it away, I didn’t even get a piece myself, she kept it all for her! The recipe comes from and old cookbook my mom has that isn’t reprinted anymore. 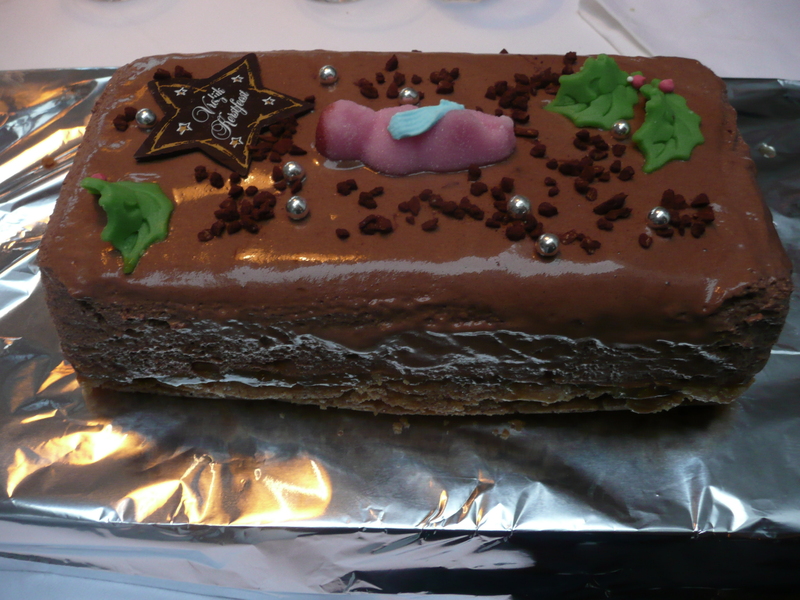 As you can see, I need to work on my cake-writing skills but luckily that doesn’t affect the cake at all! 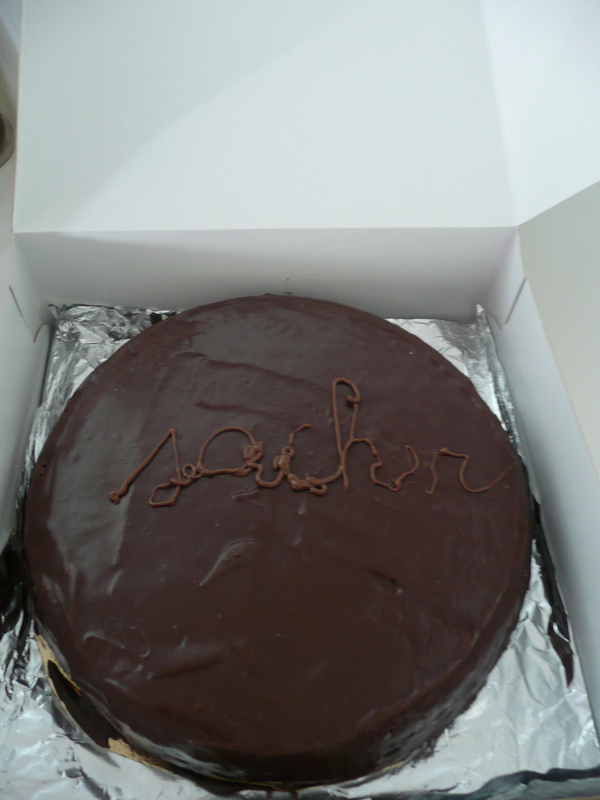 A sachertorte is a chocolate cake filled with chocolate mousse and marmalade and covered with even more chocolate. So first, make the chocolate mousse. You can easily make this one or more days ahead. Melt 75 g dark chocolate “au bain marie” (so in a bowl over hot water – you can also microwave it, but put the microwave in defrost mode and stir regularly because if the chocolate burns it won’t stay smooth). Seperate 2 eggs and beat the yolks with 2 tbsp sugar until it’s foamy. Now stir in the chocolate. 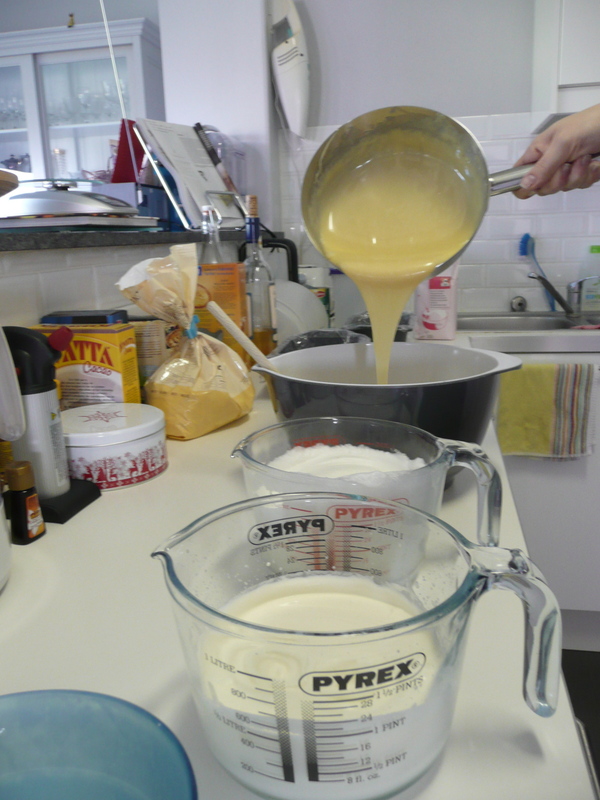 Beat the egg whites very stiff (you need to be able to hold the bowl upside down, and that’s not a joke! ), it goes easier if you add a little pinch of salt. Spoon the egg white under the chocolate mix and put the bowl in the fridge for a couple of hours or over night until it’s a mousse! Now make the chocolate cake: first grease a 26 cm round cake tin and preheat the oven to 140 C. Separate 6 eggs and beat the egg whites very stiff in a large bowl. Put the mixer on the lowest speed and, while continually beating, add the egg yolks, a packet of vanilla sugar (or the seeds from 1 pod), 200 g sugar, 1 tbsp custard powder (the kind you buy to make vanilla pudding), 40 g cacao powder, 1 and 1/2 tsp baking powder, 100 g self-raising flour (sifted) and 2 tbsp oil (I use sunflower – and you really need the oil to make the mix glossy). 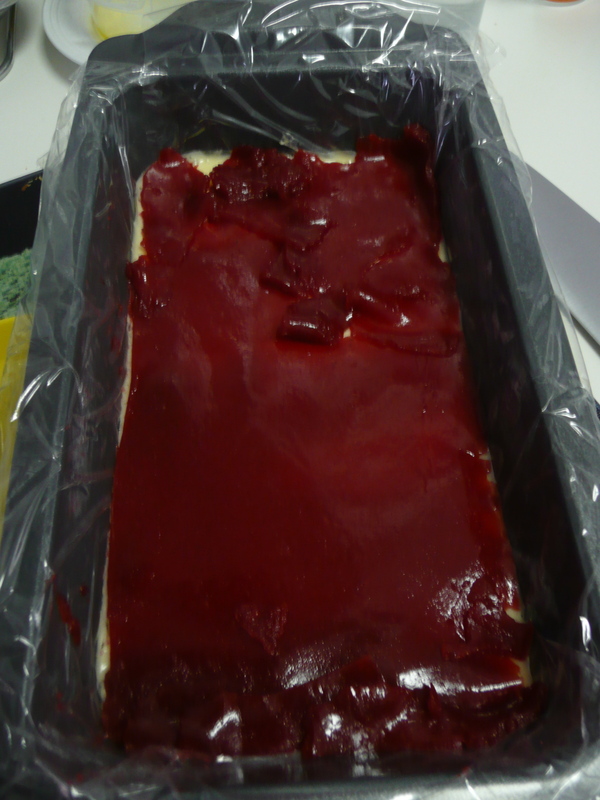 Pour the batter in the tin and bake in the oven for 60-70 min (a skewer inserted in the middle should come our clean). Remove from the tin and leave to cool on a wire rack. 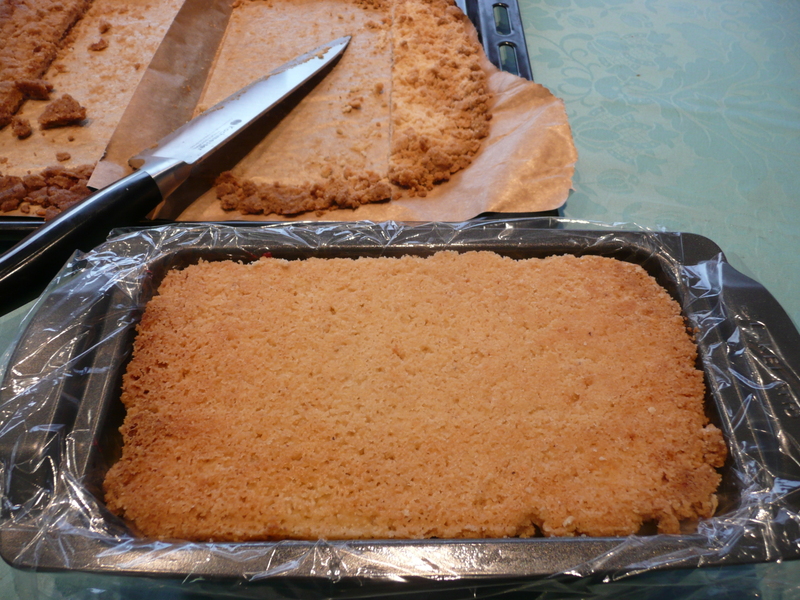 Now we’re starting to assemble: first, split the cooled cake horizontally. I do this by using a long sharp knife cutting halfway through the cake and then turning the wire rack around until I’m back where I started from. Add a layer of chocolate mousse to the bottom half, followed by orange marmalade (you can also use raspberry if you prefer, but you’re cake will be a lot sweeter if you do so, now it gets a tangy taste). Put the upper half back on top. Melt 100 g dark chocolate with 2 tbsp cream (again “au bain marie” or in the microwave on low). 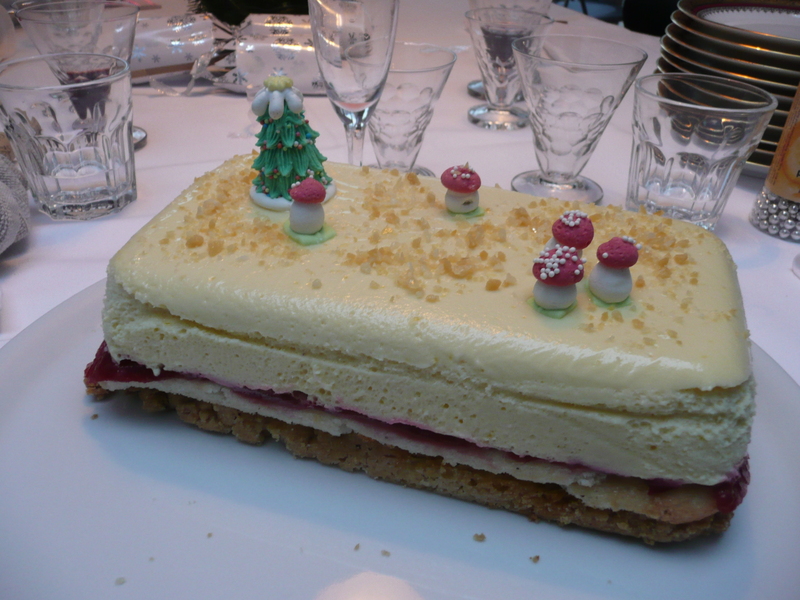 Use this to cover the top and sides of the cake. If you want to write something on top, just melt a bit more chocolate to do so. Enjoy!